The future of Burnley’s iconic Queen Street Mill Textile Museum remains shrouded in uncertainty, months after it was closed as part of county cost-saving measures. The popular mill in Harle Syke, the world’s last remaining steam-powered cotton mill, was closed on September 30th and mothballed by Lancashire County Council. The authority announced it was in talks with an interested organisation to take over the running of the museum, and this week confirmed those talks are still continuing. 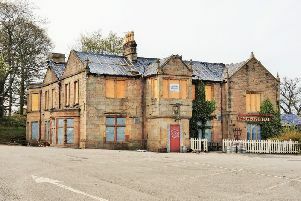 The county council also revealed it had been carrying safety and maintenance work recently on the Victorian building. But respected Burnley historian and Briercliffe parish councillor Roger Frost said he had “hit a brick wall” when trying to discover what was planned for the museum. Coun. Frost, who called passionately for the museum to be saved from the axe, said: “I have no idea what is happening with Queen Street Mill. “Every time I ask the county council for an update I hit a brick wall. I do know that some maintenance work was carried out to the chimney recently. “I can understand that negotiations between private parties must be kept secret, but it has been some time now. Queen Street Mill’s 300 power looms were still driven by its famous steam engine “Peace” in the Victorian weaving shed. In 2011, a scene from the Oscar-winning film “The King’s Speech” was shot in the weaving shed. It also featured in the BBC series “North and South”, “Life on Mars” and most recently appeared in the 2015 BBC adaption of “An Inspector Calls”. The Queen Street Mill Manufacturing Company was established in 1894, capitalised with ₤£20,000 in £5 shares. The company built the Queen Street Mill between 1894 and 1895. As money was scarce only one Lancashire boiler was installed, and it was six years before the second was bought. The weaving shed was single storey, and the mill frontage was three storey.